Junk Mail Mania and Envelope Excitement! If your household is like ours, we get lots of junk mail. Before you throw the undesired mail away, why not stop to play? and give it a purpose before meeting the land fill. 1. Kids love to lick envelopes! Save all the return envelopes for days when kids want to “write” notes to loved ones. Provide colored pencils, crayons and or markers. Let them draw pictures on unwanted pieces of mail or scraps of paper. Then they can put their notes and letters in envelopes and seal. Square stickers can be used as stamps to further expand this creative play. For the older child this would be a great opportunity to teach and practice writing their name and address. 2. Extend the above play by playing “postal carrier”. Use an old purse or fabric shopping bag as the letter carrier’s bag. Large ride in toy cars or tricycles can be used as the mail car. Children can “deliver” the mail to each family member by slipping the envelopes under bedroom doors or leaving them in places for parents and siblings to find. Small cardboard boxes could also be converted into mailboxes for children to mail their letters. Envelopes convert easily into a puppet. First fold in the flap or cut it off. Place our thumb in one corner and your middle finger in the opposite bottom corner of the envelope. 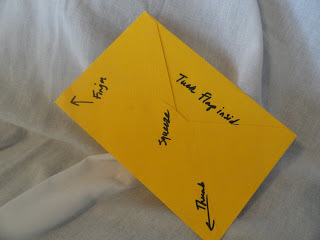 Then squeeze folding the envelope in half. You are ready to decorate with markers, crayons, colored pencils, felt, yarn, stickers, or anything else you can imagine. Then it is time to put on a puppet show!